Happy and Healthy: ARE MICROWAVE OVENS SAFE? I’ve always been dubious about using a microwave oven for heating food or drink. We bought a really nice microwave when we did up our kitchen seven years ago. There it sat on its special shelf…I just couldn’t make myself use it to feed our family. So in the end we sold it, almost brand new, on Trade Me to someone who was very happy to buy it. People often ask me about microwave ovens and I usually respond in the negative. If they were to ask me why, which they usually don’t (sigh of relief), I really didn’t have a convincing answer. Actually most people don’t understand how microwave ovens work anyway and have heard vague suggestions about microwaves not being very good for you – that’s why we say with some cynicism… “I’m just going to nuke my coffee,” or whatever. I’ve had enough of my confusion over this issue and I want an answer. “Are microwave ovens a source of danger or are they safe? Are my concerns based in the fear of a cancer scare I had in the late eighties? At that stage I examined my lifestyle, my spirituality, my stress levels, and my nutrition. I assumed a “no microwave oven” approach that I adopted from numerous informative books I read about health and healing. I never really discovered the ‘why” behind my choice – was it knowledge, or was I depending on hearsay to make my choice? I’ve tried to summarise my findings, but there is so much information available so I present you with a thirty minute read. Here is what I am discovering from my lengthy investigation into the subject. What are microwaves? Microwaves are wavelengths within the electromagnetic spectrum. The closest source of naturally occurring microwaves is our sun, though the specific wavelengths of microwaves that are emitted by our sun are mainly absorbed by our atmosphere. 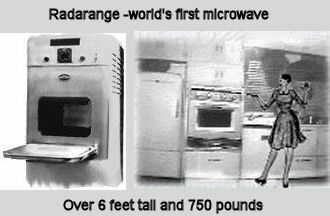 Man-made microwaves are generated by various types of transmitters. How do microwave ovens work? Man-made microwaves are created using a transmitter of sorts. In a microwave oven the waves are created in the “magnetron.” These waves are oscillating extremely fast and cause the molecules in the food to vibrate at about 5 billion times/second, thus causing friction between the individual molecules. This friction heats the food2. "There is a clear, present and ever-increasing danger to the entire population of our country from exposure to the entire non-ionizing portion of the electromagnetic spectrum. The dangers cannot be overstated because most non-ionizing radiation injuries occur covertly, usually do not become manifest until after latent periods of years, and when they do become manifest, the effects are seldom recognized." (Non-ionizing radiation means radiation that doesn’t carry enough energy to remove electrons from atoms – as opposed to nuclear radiation which is ionizing). Group Two, “NOT THEY” seems to be made up of the general public (professional and non-professional) who are aware of alternative health and criticism of the early research done in the 50’s and 60’s. One of the frequently quoted experiments I found on health websites was carried out in 1989 by a Swiss food scientist, Dr. Hans Hertel. On the publishing of his work Dr. Hertel was taken to court by the Swiss Dealers for Electrapparatuses for Households and Industry for stating that microwaved food causes blood abnormalities. He was ordered not to publish or speak further about this study. Eventually he made an appeal to the European Court for Human Rights and won the appeal for freedom of speech. The order was partially removed by the Swiss government in 1998. William Kopp mentions that from 1957 to 1999, researchers experimenting with microwaves at the Institute of Radio Technology at Klinsk in Byelorussia found that prepared meats, cereal grains, root vegetables and milk heated in a microwave oven created cancer-causing agents in these foods. Ingestion of these foods caused a higher percentage of cancerous cells in the blood. These findings caused microwave ovens to be banned in Russia in 1976,9 they were apparently reinstated in 1987 as a result of international pressure on free trade. In the journal Paediatrics (vol 89, no.4, April 1992), there was an article entitled, “Effects of Microwave Radiation on Anti-infective Factors in Human Milk.”11 It was reported that microwaved breast milk showed degradation of antibodies which may have been caused by ‘hot spots’ created by uneven heating which is characteristic of microwave heating. Opponents, “THEY”, often state that the Hertel study is not valid as it hadn’t been properly set up to eliminate variables. However, I wonder why funding cannot be found to carry out some food related research that will settle these questions. Perhaps it’s because microwave ovens are just the smallest tip of the whole microwave technology iceberg. With regard to the New Zealand situation, the National Radiation Laboratory has been measuring microwave leakage from a wide range of new and used ovens for several years. In the most recent survey 228 ovens were checked and any leakage was well below the maximum permitted level.12 When I read this I realised that it is expected that microwave ovens must leak otherwise there would be no need for the safety standard to be applied to them. Now that I’ve read a range of articles, scientific research papers, skim read the Hertel court case and considered many opinions, my response is that if there is even the tiniest wisp of smoke there must be fire somewhere. It appears that microwave ovens are relatively harmless operated at the safety levels for exposure that we have in place. Like so many things moderation is the key. From my reading I have been alerted to the increasing exposure to electromagnetic fields that is progressively being experienced into our own homes. I’m talking about wireless, cell phones, Smart Meters and so on. Let’s not bury our heads in the sand as we need to look into these things for ourselves and not be carried away by fear or ignorance. Thanks to all of you who responded to my question about whether you’d use a microwave oven to warm baby formula (if you couldn’t breastfeed) or baby food. About 90% of those who replied said that they wouldn’t use a microwave to heat a baby’s food. Your replies helped me and caused me to look in various directions for information.